I've got so many cards incoming that I wanted to take a few days off before blogging again .. but the the Devils had to go and make a blockbuster trade, sending forward Adam Henrique to Anaheim in exchange for defenseman Sami Vatanen. The trade addresses glaring needs for both clubs - New Jersey is desperate for a top-4 defenseman and Anaheim is shorthanded at center with injuries to Ryans Getzlaf and Kesler. 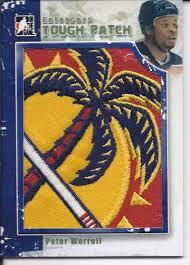 Henrique and Hall were junior teammates on the Windsor Spitfires, which explains the Panini Prime card pictured below. They weren't quite 'fire' together in Jersey, but Hall cited Henrique as someone who helped acclimate him to the Devils and New Jersey. The last five years have been among the worst in Devils franchise history, and Adam Henrique has been one of their best players over that stretch. 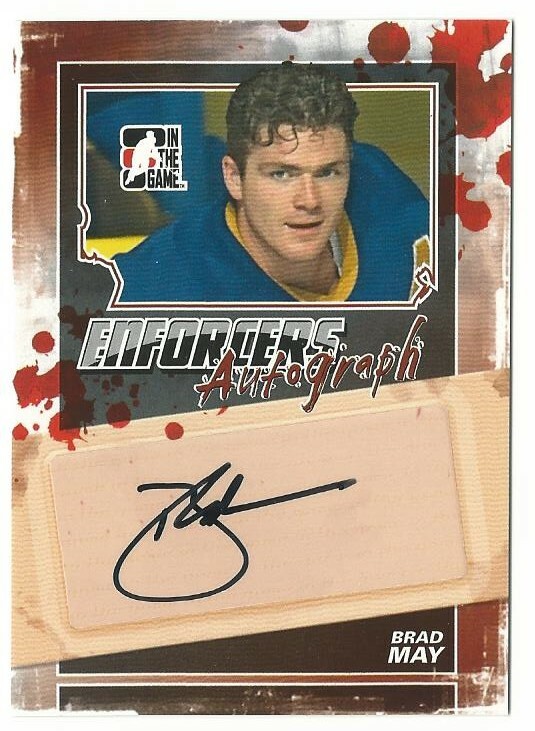 As a result, his hockey cards have been plentiful and affordable. 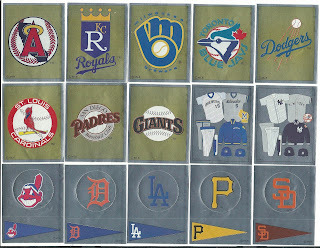 I almost picked up a second copy of that Jumbo Materials jersey last week; there was one on COMC for $2.05. 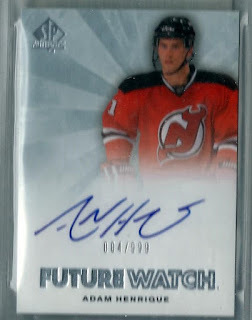 This Ice auto cost just $3.45 on Black Friday, due to surface wear, edge wear, and corner wear. I guess we'll see how severe it is in a week or two. Thanks for everything, Rico. Good luck in Anaheim! I’ll never forget you, I hope you’ll never forget me. 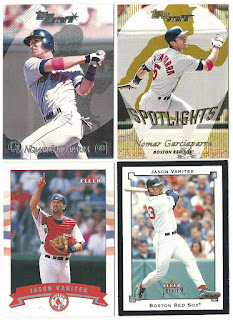 One of the newest additions to my blog roll is the uniquely named Cards My Mom Didn't Throw Out. 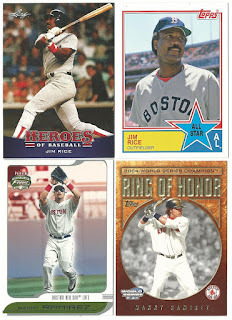 I came across JayP's blog a short time ago and offered to send him my 2017 Topps Heritage extras for his set build. 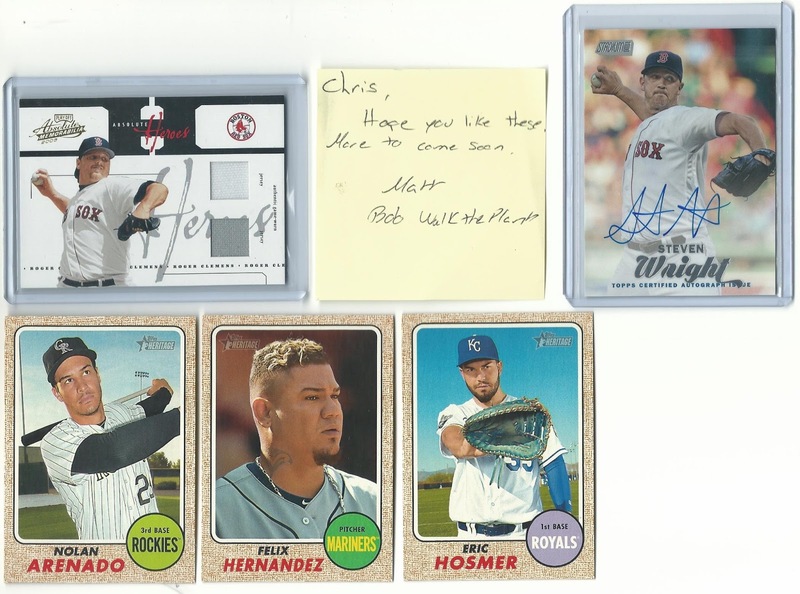 I've got almost two base sets of regular Heritage and High Numbers, so I wasn't asking for anything special in return for the 60 cards I sent to JayP. But when a stuffed bubble mailer arrived at my door on Monday I knew I had met a very generous trader. That Opening Day Stars card does not scan well, in or out of a top loader. Bryce Brentz is still hanging around as a 4A outfielder in the Sox organization. Edwin Escobar pitched for the Diamondbacks - JayP's favorite team - in 2016. He spent the 2017 season in Japan. 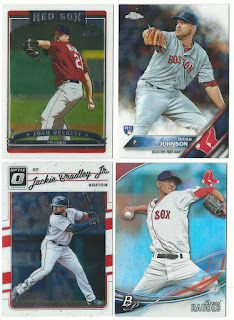 Apparently Keith Olbermann wrote the text for these cards. First of all, I want his life. 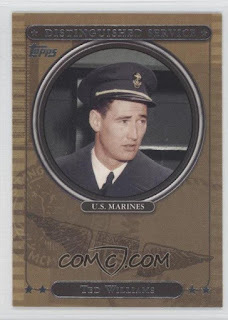 Are there any other journalists/celebrities that have collected and helped create baseball cards? I haven't heard of one. And how old was he when he worked on this set? Did he self-edit the text for all 400+ cards? Is this typo an anomaly, or is this set as error-heavy as Pro Set Hockey? Either way, I definitely want to find some more of these. Thanks for the trade JayP! 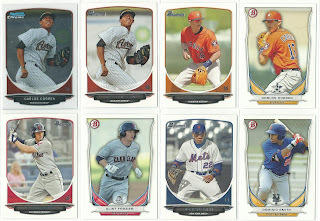 If I come across any Heritage cards and Diamondbacks I'll send 'em your way. 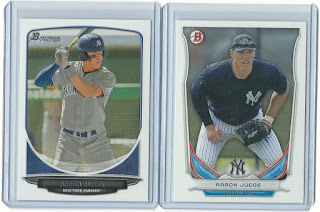 Just before Thanksgiving I received my Black Friday order from Blowout Cards. There were at least four different products included - but a significant portion of it was included my Secret Santa gift to someone who might be reading this, so I won't reveal what I bought. Enforcers is a unique set in that it focuses on the NHL's tough guys rather than the scoring stars. 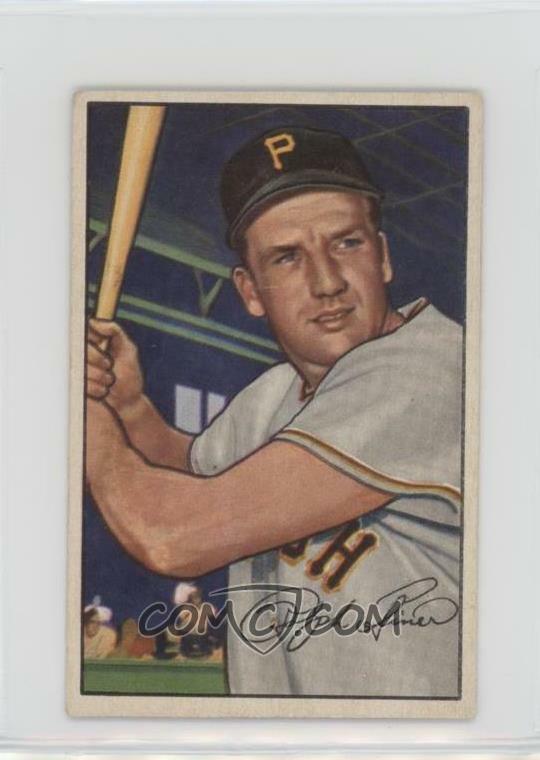 It was a controversial release at the time after the deaths of three such players earlier that year. 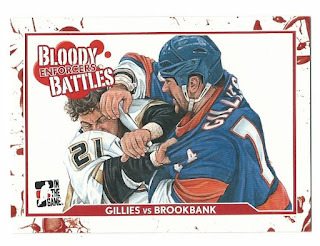 Many of the cards have blood-stained backgrounds and depict in-game action photos of two players fighting - something that had been banned from traditional hockey card releases. 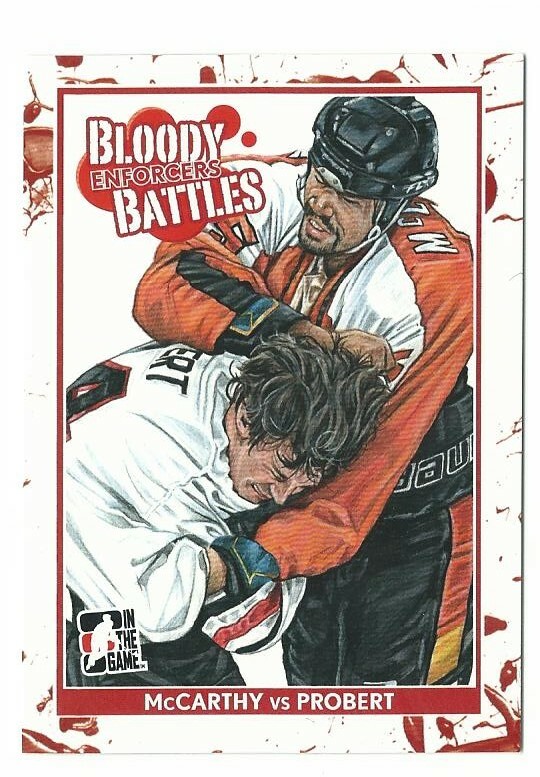 For the purposes of this post I'll refrain from the debate about fighting and its place in the game of hockey - except to say that I'm somewhere in the middle. 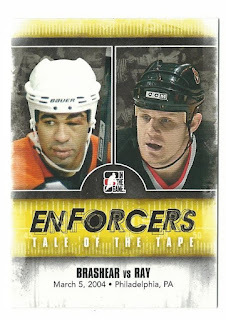 I don't want to see fighting (or enforcers) completely disappear from the NHL but I don't think I'd be a fan of 1970's-style hockey, when games often featured more brawls than goals. 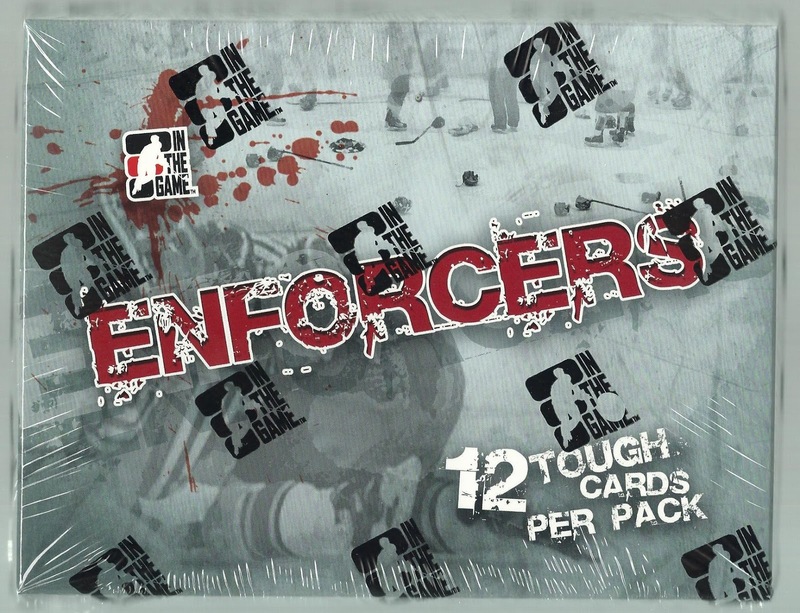 When In The Game released Enforcers, the price of a 12-card box was about $60 US. 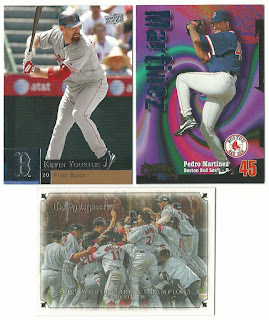 I bought at least two boxes at the time, hoping to pull a rare Peter Worrell card. No such luck. 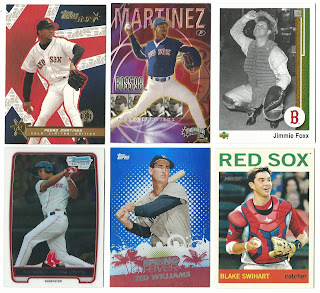 Five years later, I thought I'd try one last box - at the Black Friday Blowout price of $39.11. Each box contains 5 autographed cards (all hard-signed, no stickergraphs) five base cards, and two memorabilia cards. Instead of a sealed pack the cards are contained in a 2-piece UltraPro plastic holder nestled inside the outer box. This would appear to be safer (though at least one card was slightly dinged) but it also reveals the top card. 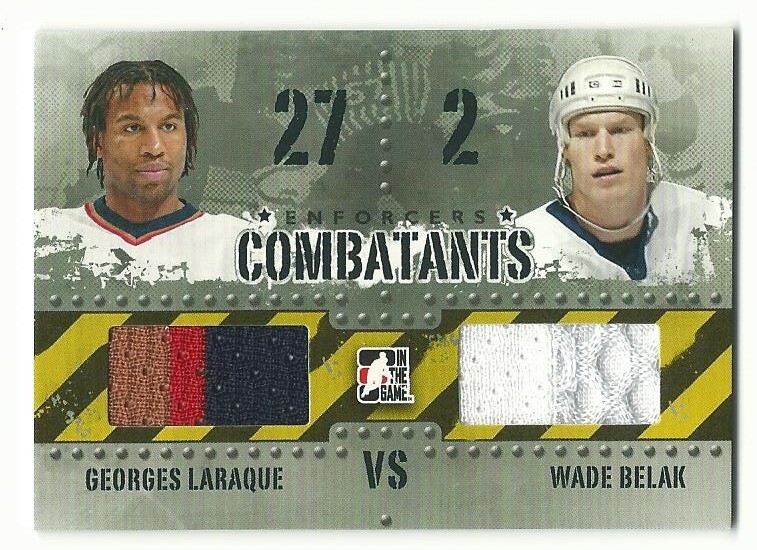 This is a standard Combatants dual relic (there are red versions limited to ten copies) However, the 3-color swatch of Georges Laraque's Oilers jersey and the mesh on Wade Belak's Maple Leafs sweater are a cut above. 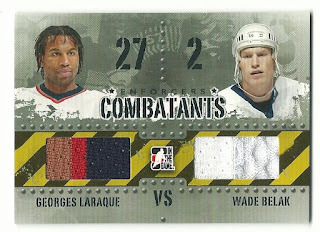 Many of the dual relics are multi-color and/or patch relics; In The Game did a great job of keeping the swatches interesting. 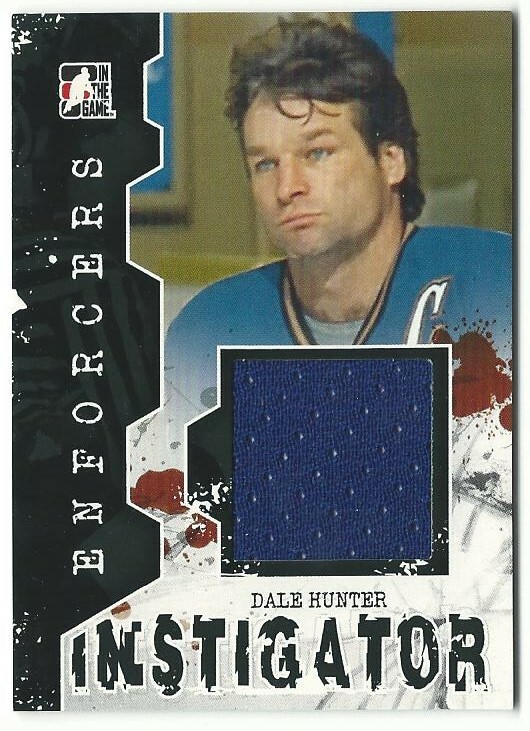 A standard Instigator jersey card of Capitals tough guy Dale Hunter. 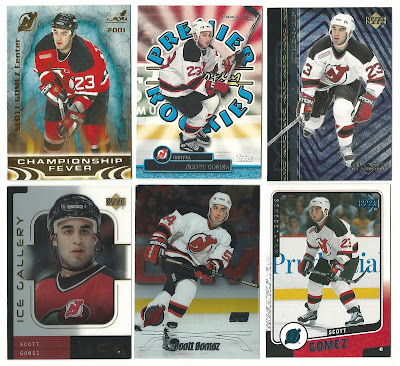 Hunter is one of the most accomplished players featured in this set, having amassed over 1,000 points over his 19 seasons in the NHL. More notably for this set, Hunter is second all time in penalty minutes with 3,565 career PIMs - and was suspended 21 games (1/4 of a season) for this vicious hit on an unsuspecting Pierre Turgeon in the 1993 Stanley Cup playoffs. 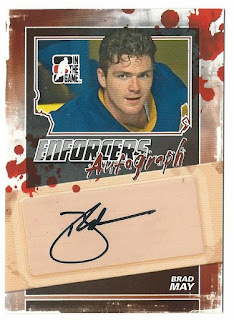 Now we get to the Band-Aid and blood splatter portion of the pack -- the autographs. Phil Russell was a first round pick of the Blackhawks in the 1972 draft. 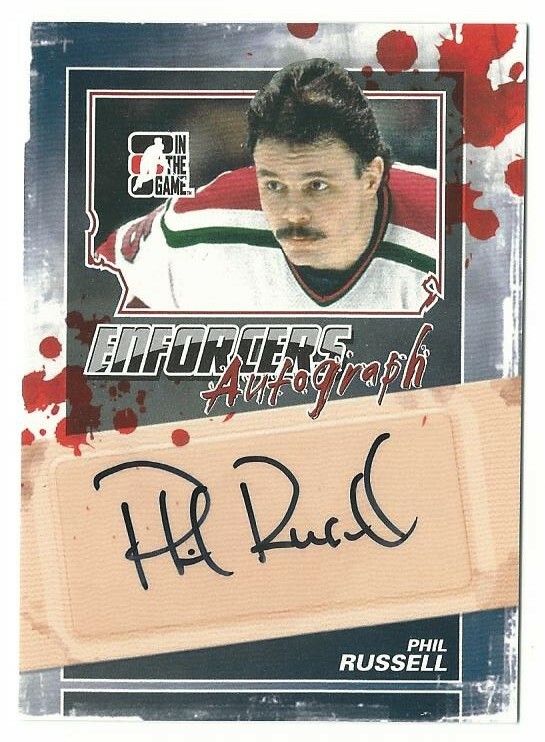 He played over 1,000 NHL games and logged over 2,000 penalty minutes for four teams, including the New Jersey Devils. 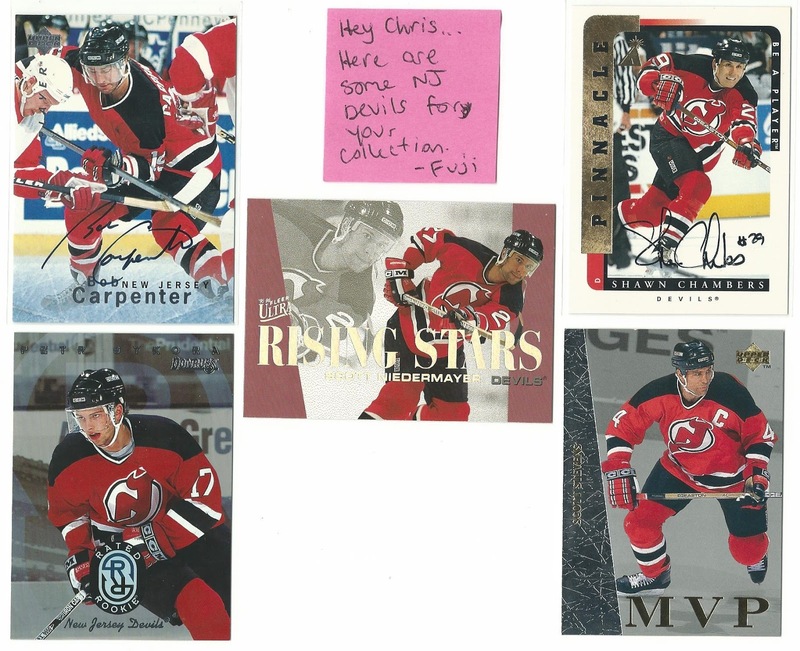 Russell is headed to the box - my Devils PC box - since he's pictured in the classic red and green sweater from their early years in New Jersey. 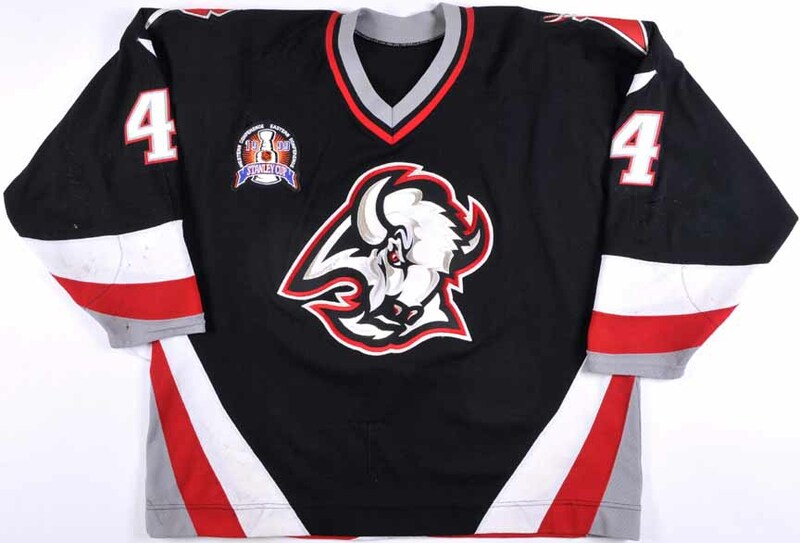 Back-to-back Buffalo Sabres - or so I thought. 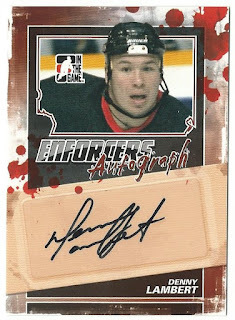 At first glance it appeared that Denny Lambert was wearing this late 90's Sabres sweater - but he never played for the team - which means this photo was likely taken during his two-year stint with the Ottawa Senators. Lambert was the NHL's league leader in penalty minutes in the 1999-2000 season, with a relatively tame total of 219. 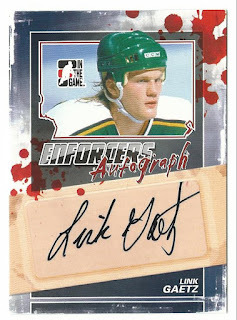 Link Gaetz was part of the bizarre formation of the expansion San Jose Sharks - in which the Minnesota North Stars supplied half the Sharks' players, then replenished their roster by participating in the Expansion Draft alongside the Sharks. Link's career was short-lived, but he still holds the Sharks single-season record for penalty minutes with 326, set in their inaugural season of 1991-92. 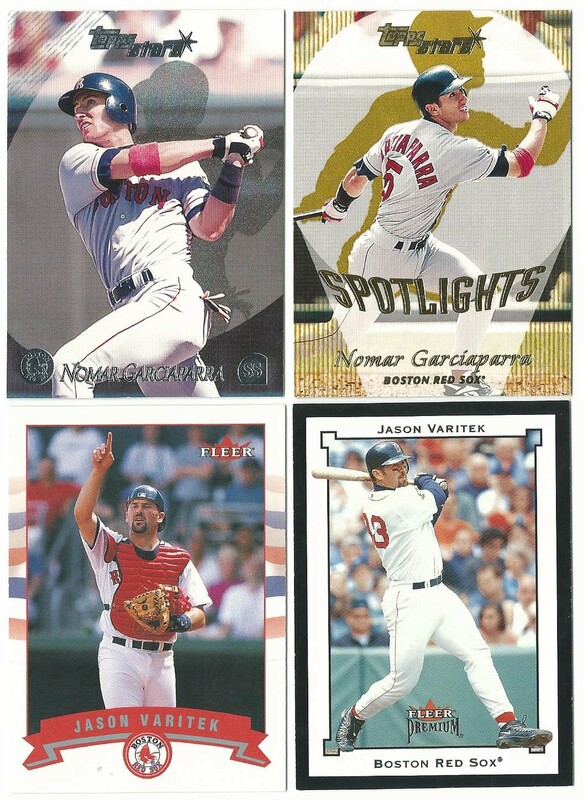 Bryan Watson's 16-year career ended before I was born. 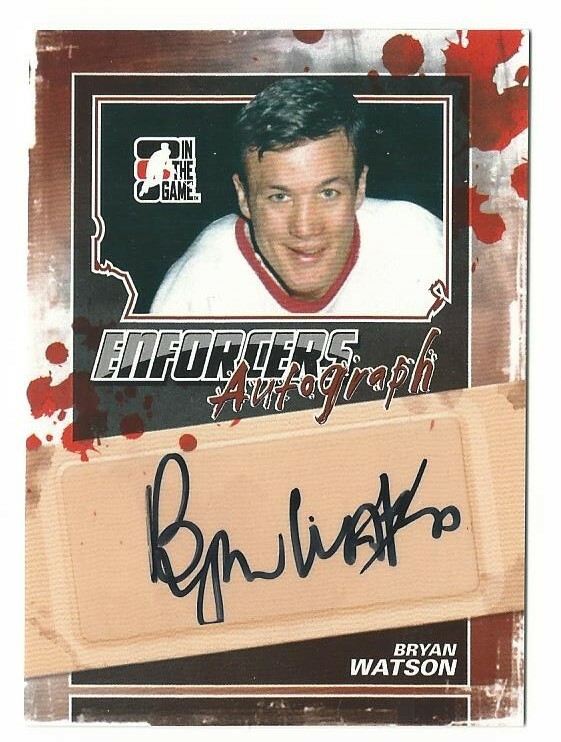 Didn't know what position he played or what teams he played for (he's pictured in a Detroit Red Wings sweater), though his name sounded kind of familiar to me. 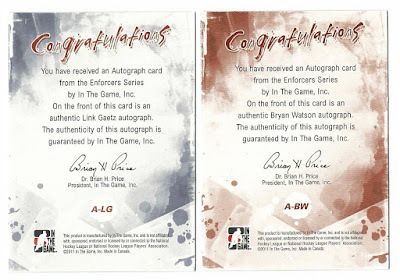 With the Pittsburgh Penguins in 1971-72, Watson led the league in penalty minutes with 212 - the lowest league-leading total until the lockout-shortened 2012-13 season. I can't think of any reason for this (such as AFC/NFC in football) but it's not a variation. As far as I can tell, all of the Link Gaetz cards are blue, and all of the Bryan Watson cards are red. 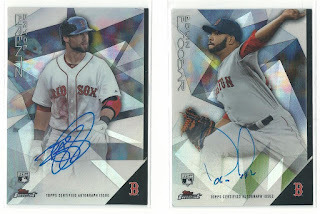 That's it for the autos and relics...but there are still some hits in this box. Literally. 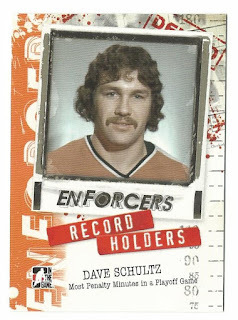 Dave Schultz holds a lot of penalty-related records. 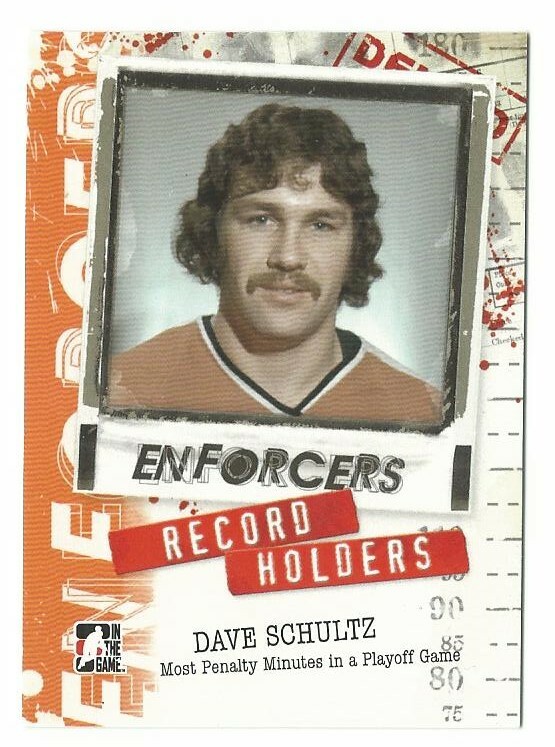 This card recognizes his 42 PIMs in a playoff game against the Maple Leafs in 1976. 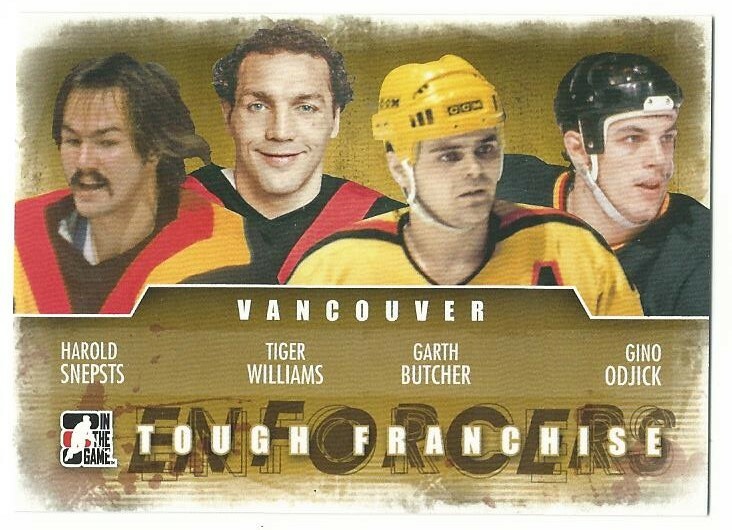 The "Hammer" squared off against Scott Garland and Tiger Williams, in a brawl-filled game straight out of Slap Shot. I have no idea how the NHL cleaned up its act by the end of the 1970's, but I'm guessing it had a lot to do with the arrival of Wayne Gretzky. I'll have to be honest - this card stumped me. 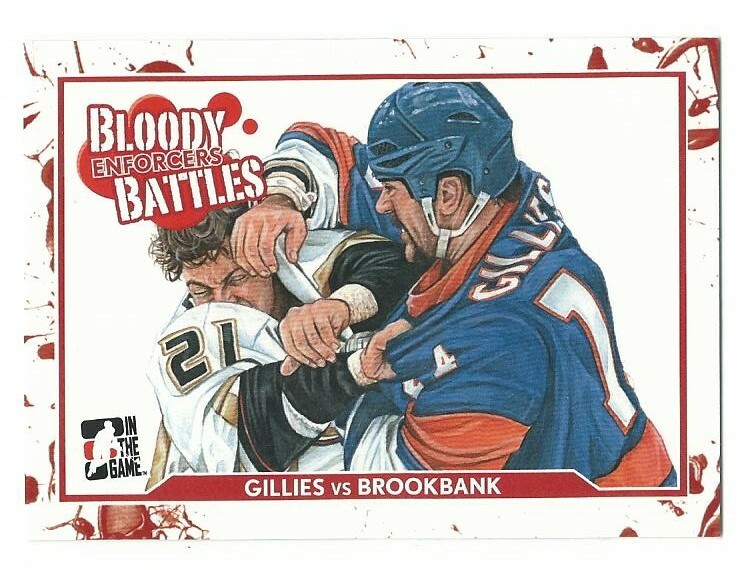 I didn't know if it was Wade Brookbank or his brother Sheldon, and the only Islander named Gillies that I could recall was Clark Gillies - who retired years before the Ducks franchise existed. The card back didn't help. 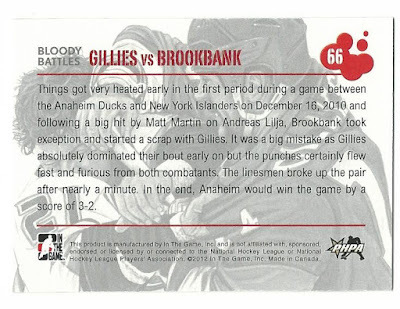 Through some sleuthing on hockey-reference.com, I deduced that the combatants were Sheldon Brookbank of the Ducks and Trevor Gillies of the Islanders. 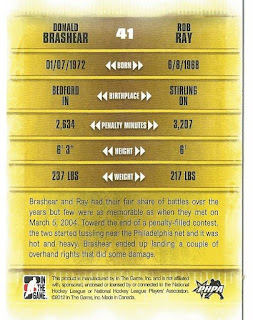 Last card in the box... a Tale of the Tape card featuring Donald Brashear and another Sabre bad boy, Rob Ray. 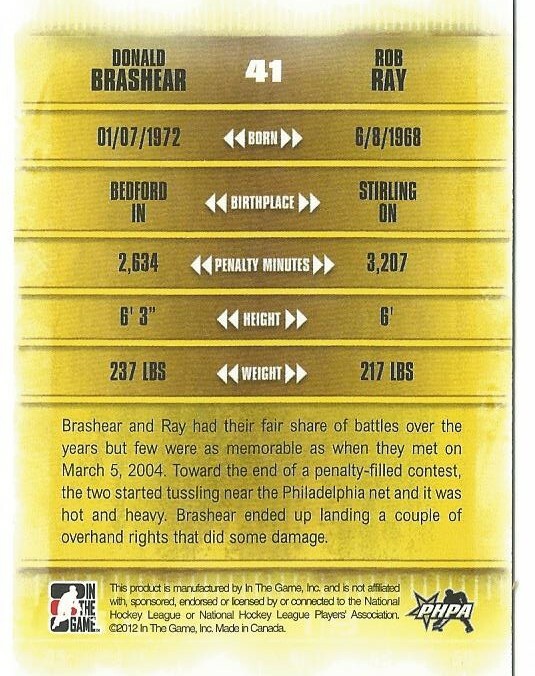 Looks like Brashear got the worst of this bout, though that photo may have been taken after a different fight. Overall,this was probably an average or slightly below average break. I didn't get any higher-end hits like Fight Straps, Tough Franchise Quad jerseys, or the 1 of 1 Nameplates and Tough Patches. 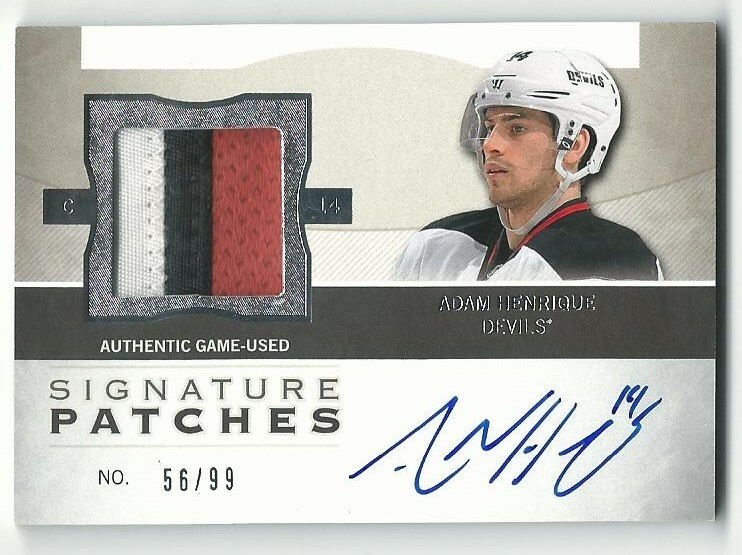 However, I did get a nice multi-colored swatch and a Devils autograph for my PC. 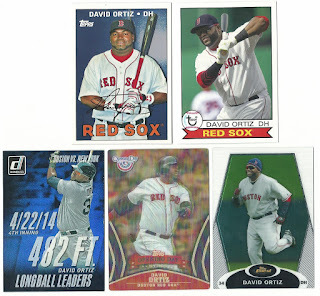 There aren't too many sports card products that guarantee seven hits for under $50, so I can't complain. 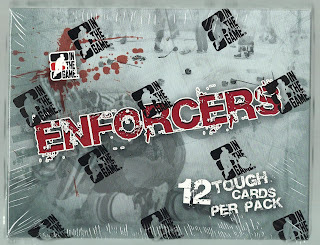 Do you have a favorite enforcer? 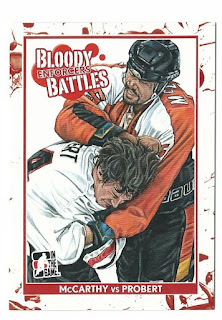 What do you think of fighting in hockey? 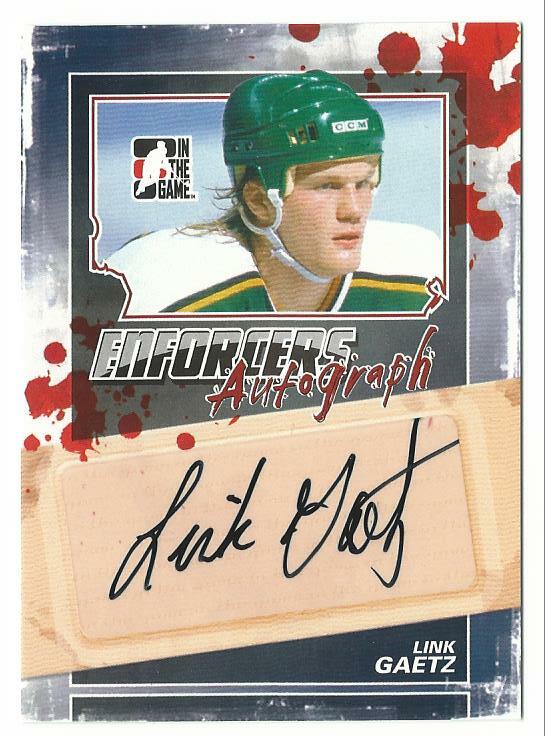 If you're not a hockey fan, would you purchase a specialty product of role players in your favorite sport? Do you have any ideas for a similar product (such as Quarterback Club or All-Goalies)? 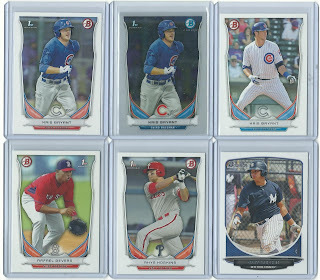 I purchased about 75 cards during COMC's "Autumn Sales Event" - most of them were low-end set fillers but I did splurge on two $10+ cards. 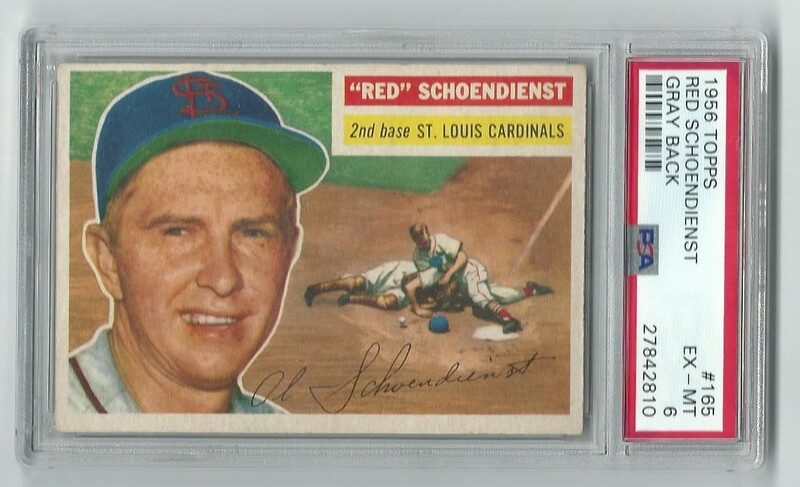 Although Bowman cards are less valuable and prestigious than their Topps counterparts, there aren't many commons without condition notes on COMC listed at less than $5.00. 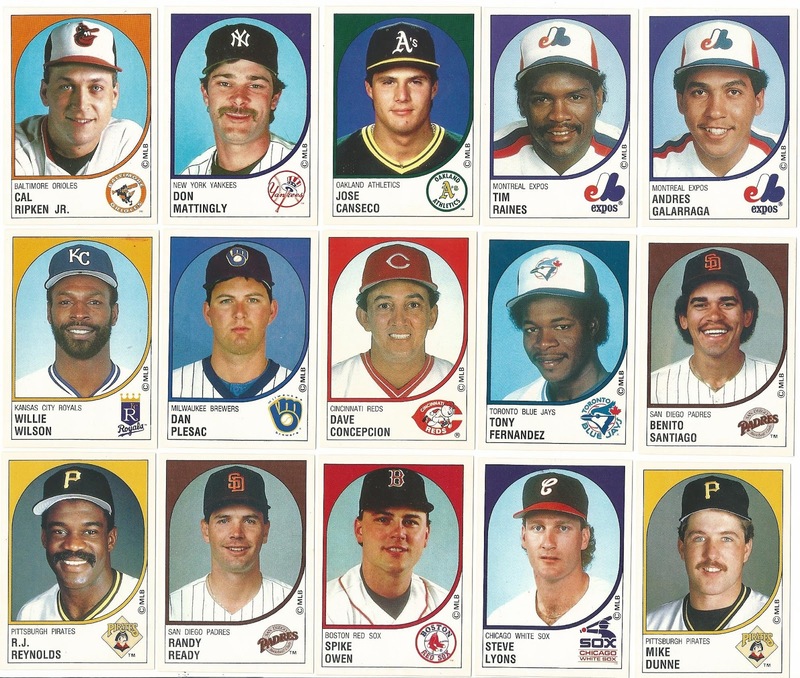 There are no Hall of Famers available in any condition to be had for under $5.00. 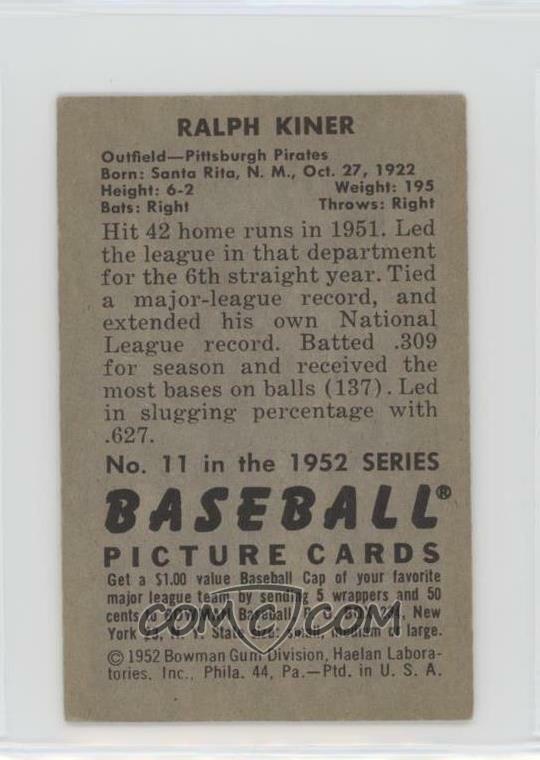 So I'm very thankful that I was able to snag this Kiner card for only $4.25. 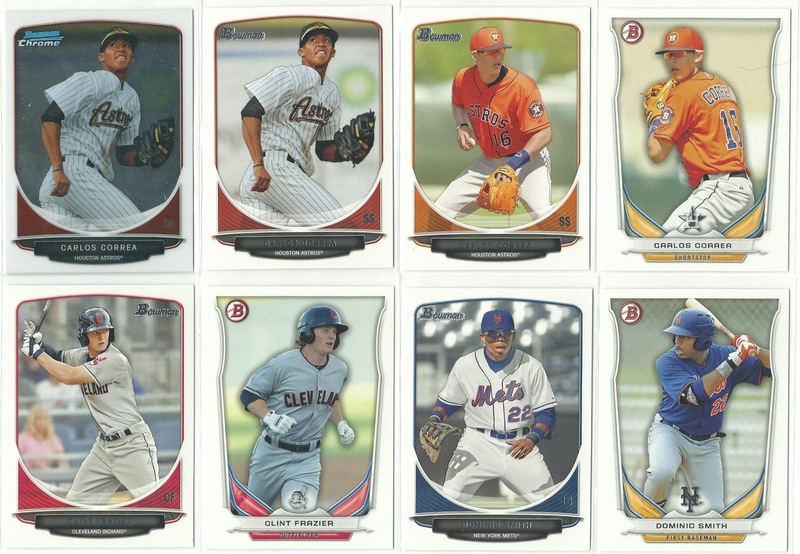 I'm also thankful that Black Friday is just around the corner, and I'll have a steady stream of new cards arriving at my door. Not sure what will land first - my Blowout Cards order, or my Secret Santa gift. Either or both of those will make a great bridge to the 500+ cards arriving from COMC sometime in December. and Corky, for creating not one, not two, but four custom cards for me. I'm thankful for blogger friends with a background in Graphic Design and a passion for pasteboards. 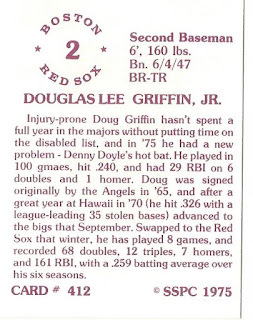 And I'm thankful for those of you who read and comment on my blog, and to the baseball card blogosphere at large for making me feel at home in this community. I hope you all have a Happy Thanksgiving (unless you're Canadian, in which case you've already celebrated.) 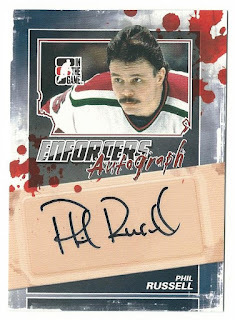 May you all find some fantastic Black Friday deals on cards.. or not cards. This has nothing to do with Thanksgiving but I wanted to share it anyway. Enjoy! I've had a few topics I've wanted to write about on this blog but haven't had the time due to work stress, life stress, and spending too much time on COMC challenges. I just got home from celebrating my wife's birthday (which is tomorrow) and my mother in law's birthday (which is today) and so this post is a lot later than I wanted it to be. My father in law passed away earlier this year. He was 70. I wrote about it on my other blog, so I wont repeat myself here. But he was a Vietnam war veteran - and a modest one at that. He never thought his two years of service as a plane mechanic with the Air Force was anything to brag about. One of his sons bought him a Vietnam Veteran's hat as a gift one year, and he wore it every day until it had to be replaced, but he never would have bought himself anything like that. He never took advantage of any medical benefits that were given to vets, and the only 'perk' I remember him taking advantage of was a free meal at a local steakhouse. 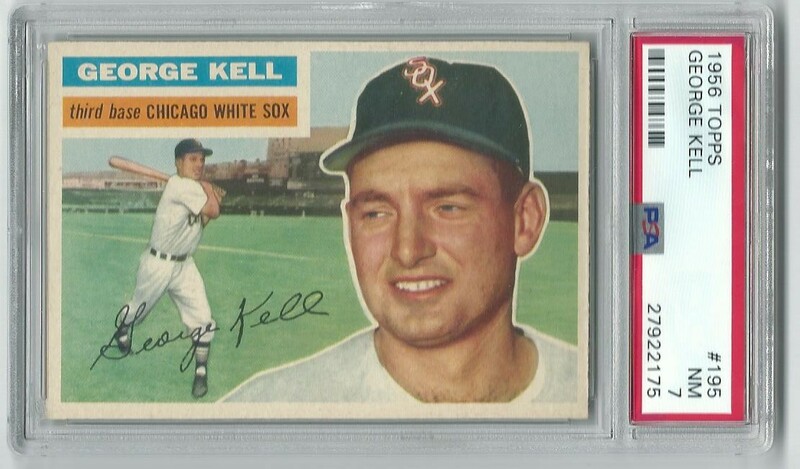 Pop was a Detroit Tigers fan, and followed the team on the radio through their championship season in 1968. My wife met Denny McLain at a card show about ten years ago and got his autograph for her dad. She said he was in Vietnam the year they won, and when she thanked him for the autograph he thanked Pop for his service. 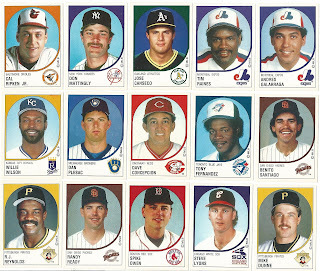 I do wish I had those in hand, just so I could scan them up and discuss them today. Pop was also a big New Jersey Devils fan, having turned in his Rangers fandom in 1982 when the Colorado Rockies moved here. 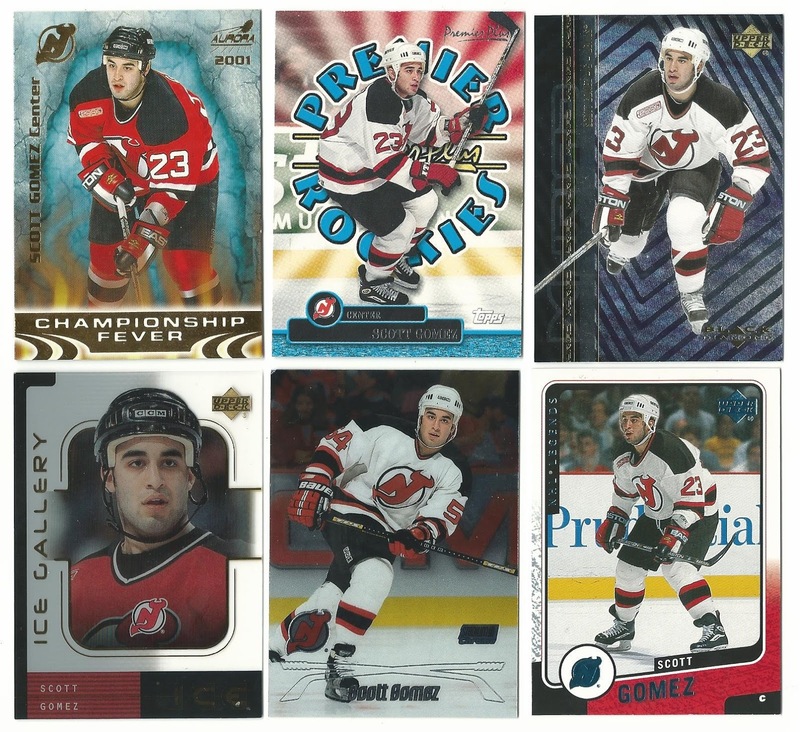 He didn't have too many Devils cards - my wife and brother in law were the hockey card collectors - but he loved going to the games. 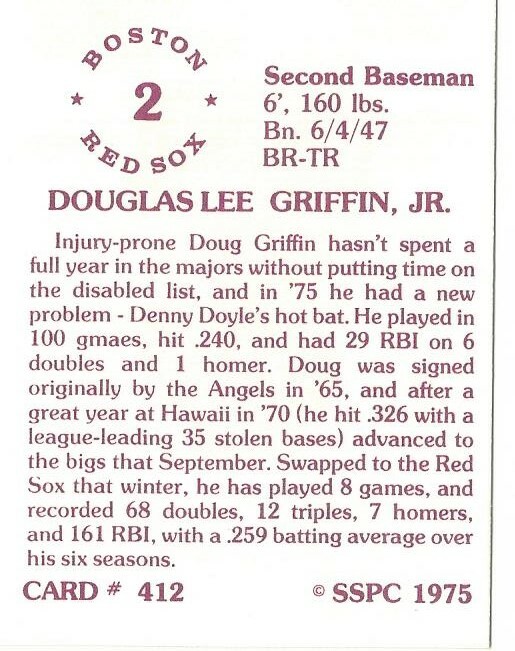 He bought two tickets to a late-season game against the Bruins for Di's birthday way back in 1992. 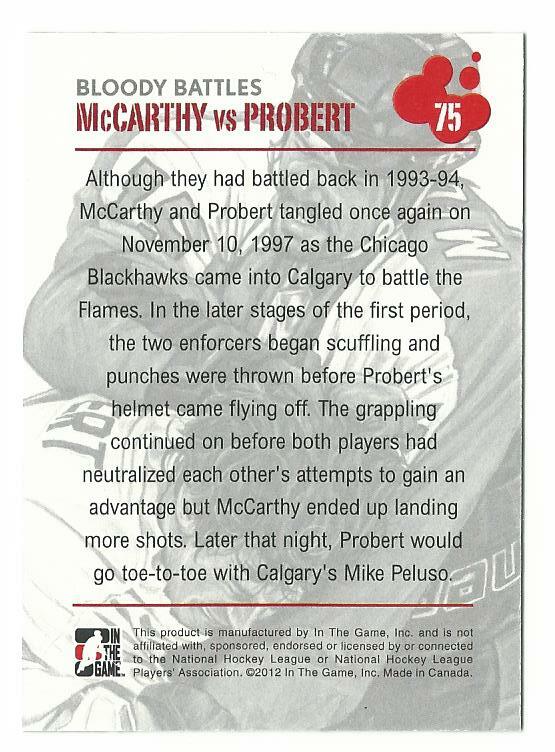 Just so happened that a kid named Martin Brodeur made his NHL debut that day. 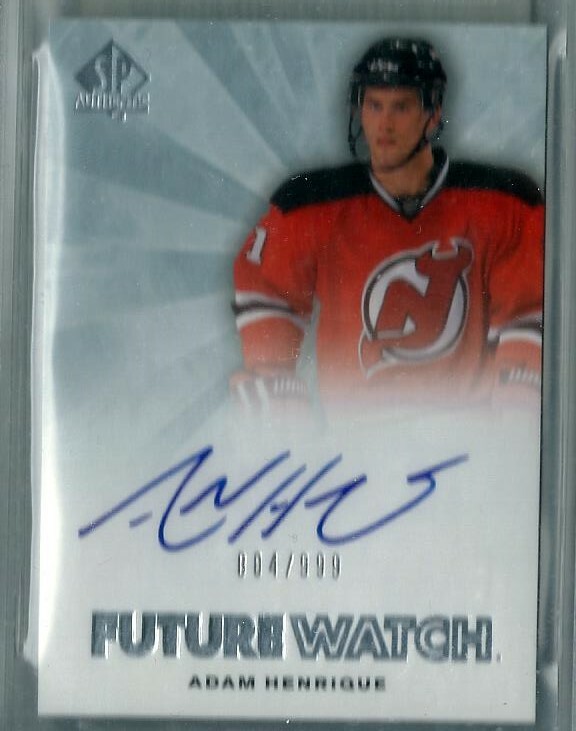 He saved the ticket and asked me to send it to PSA for grading. It came back an EX 5. 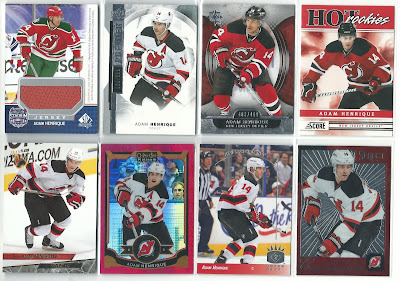 However, I do have something Devils-related in hand. 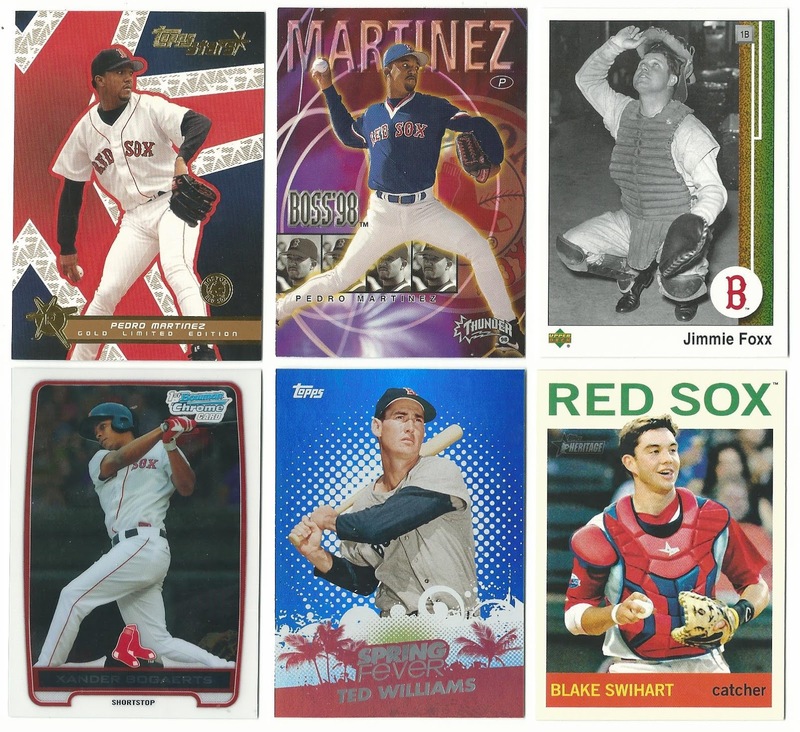 Fuji sent out a Santa-sized stack of mailers recently, and I was on his 'nice' list. 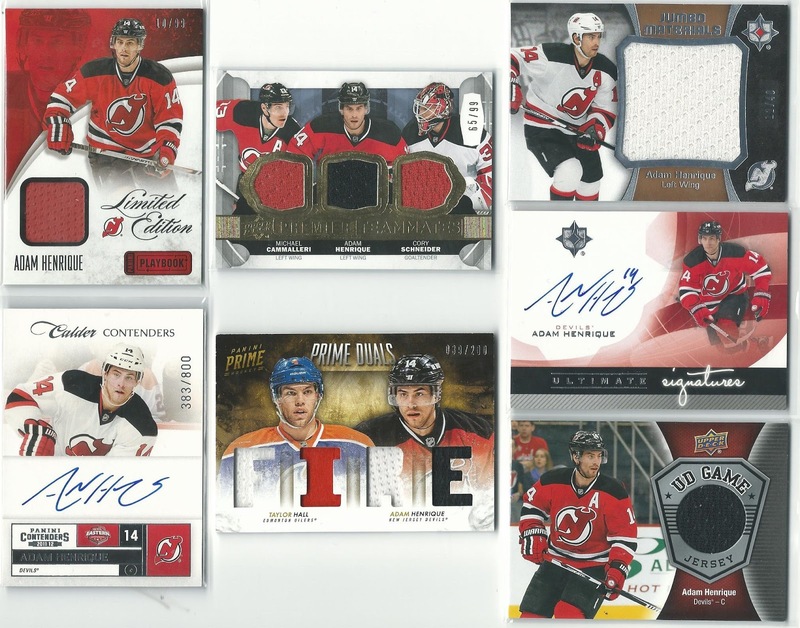 I got some great Scotts and a pair of autos from the Devils' decade of dominance. Thanks very much Fuji! 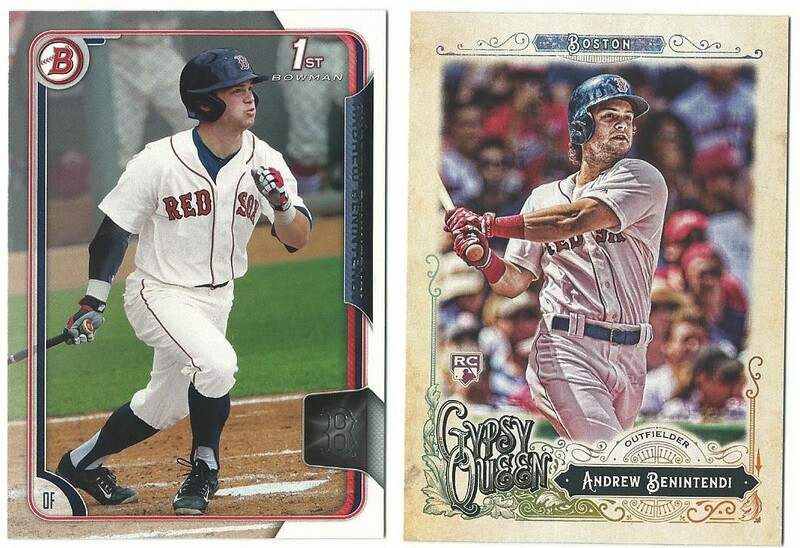 The Stadium Club Chrome Gomez is really cool (I never knew he wore #54) even with the corner ding. 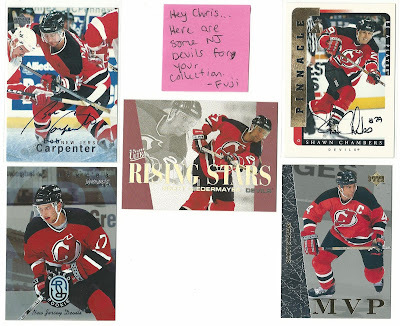 My wife met Carpenter at a Dinner with the Devils event for season ticket holders. He asked her who her favorite player is and she said... Trevor Linden. "Linden?" he replied, expecting her to name a Devil. "Why?" Di explained "He's the iron man." Then, as she tells it in a whimpering voice, Carpenter replied "I was the iron man." Pop never got to see the Devils draft Nico Hischier (the last time we spoke he said "what's going on in hockey?" and if someone hadn't interrupted I know he would have asked me if the Devs were going to draft Nico or Nolan Patrick.) 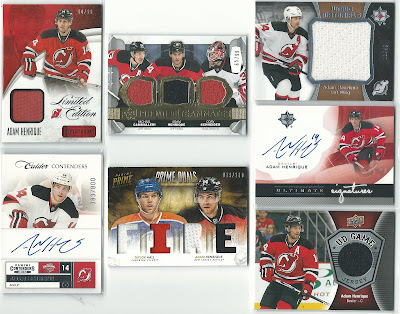 This card depicts the exact moment that Hischier's NHL career began - and even though I dislike the idea of "instant" cards, I had to fork over $3.99 for this card - plus $0.99 for the obligatory "with purchase" purchase, plus $0.25 to COMC for shipping. Speaking of COMC, Jon of the excellent blog A Penny Sleeve For Your Thoughts is running a Black Friday contest in which the winner will receive $15 in credit to spend on COMC. The contest is open until Wednesday November 15th, so if you haven't entered yet, hurry over to his blog and add your name to the list. Good luck to all who enter, and thanks for the contest Jon! I hope you're all having a great weekend - and if you know a veteran, or even if you see one in passing, be sure to thank them for their service. I've fallen into a bit of a blog block lately - haven't felt like writing much even though I've had a couple trade packages and a major eBay "trade" to report. I've had some ideas about the future of my blog(s) and I'll share those at the end of this post. For now, here are the latest additions to some of my set building projects. 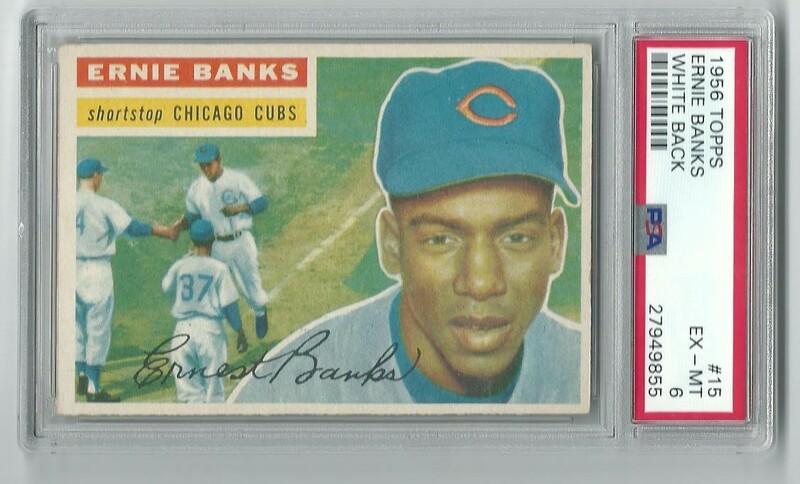 I don't like to do these very often, because I know that selling large lots on eBay isn't nearly as profitable as selling each card elsewhere would be. 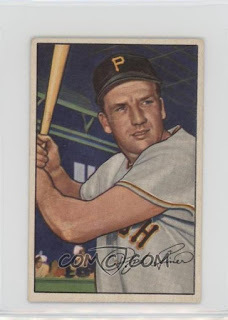 But I'm happy to add another HOFer to my 1956 Topps set build. 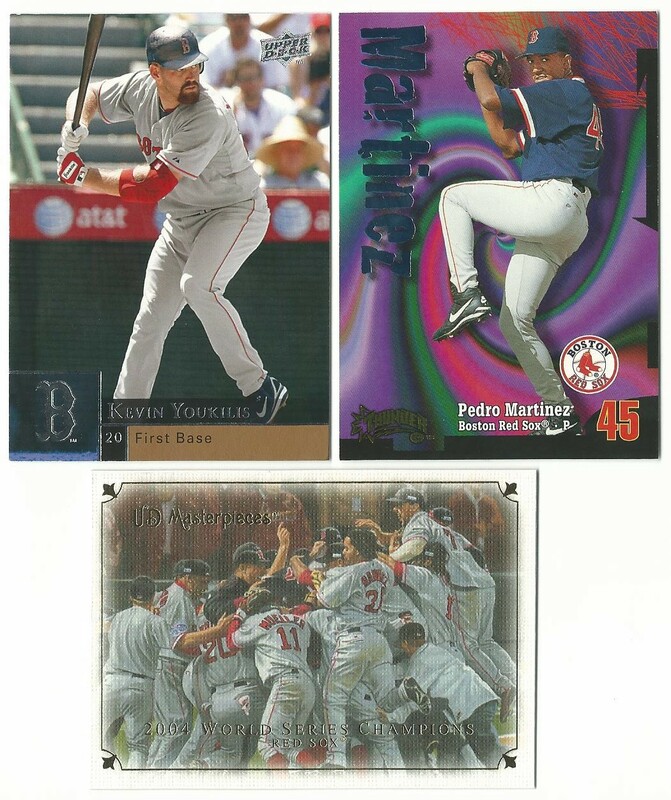 I also purchased these two on eBay, around the same time I bought the Banks. Schoendienst was virtually free, I used accumulated eBay bucks to cover all but the shipping. Kell was acquired with a best offer of $25 (plus $3 for shipping) so my total for the pair was about $30. I still need about 75 stickers from the set, but this was a huge help. Thanks for the trade Dan! 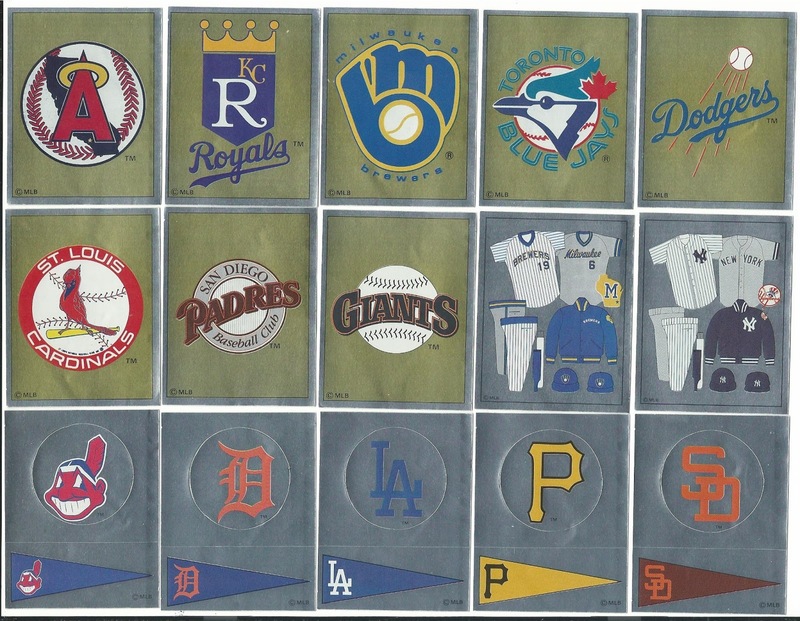 The Clemens relic is #d to 50. Very cool. Nice on-card auto of Steven Wright there, and three SP's for my never-ending Heritage set build. Thanks to this trade I've now got 81 of the 100 short prints.. in the main set. Now I need 15 of the 25 shorties in the High Number set. What have I gotten myself into? As for the blog news... 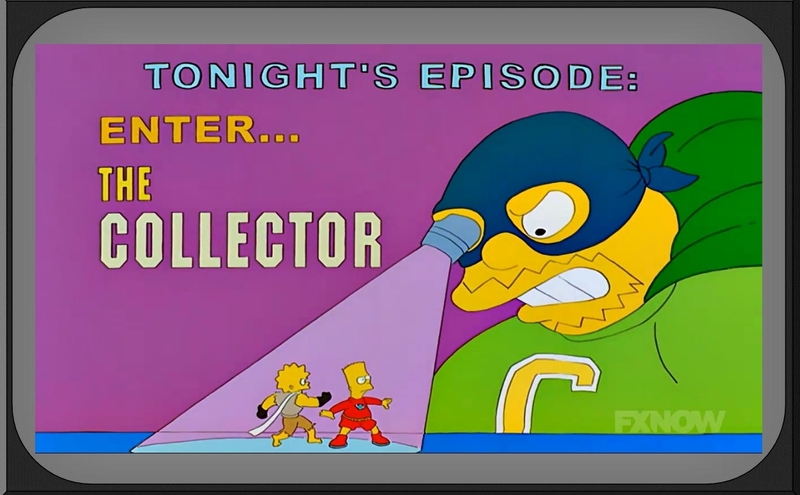 I've been thinking about merging my two blogs into one, which would likely be this one. 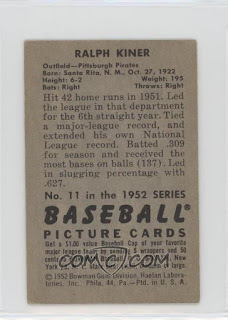 I have a concept that would work better here, and I'm assuming that my sports card readers are more open to reading about non-sports topics once in a while than the other way around. Still brainstorming about it, but if I do plan to follow through with it I'll let you know. It wont be until after Christmas, because I've got a whole lot of Black Friday posts planned once my COMC cards are shipped to me. Speaking of COMC...have any of you hit the Autumn specials yet? 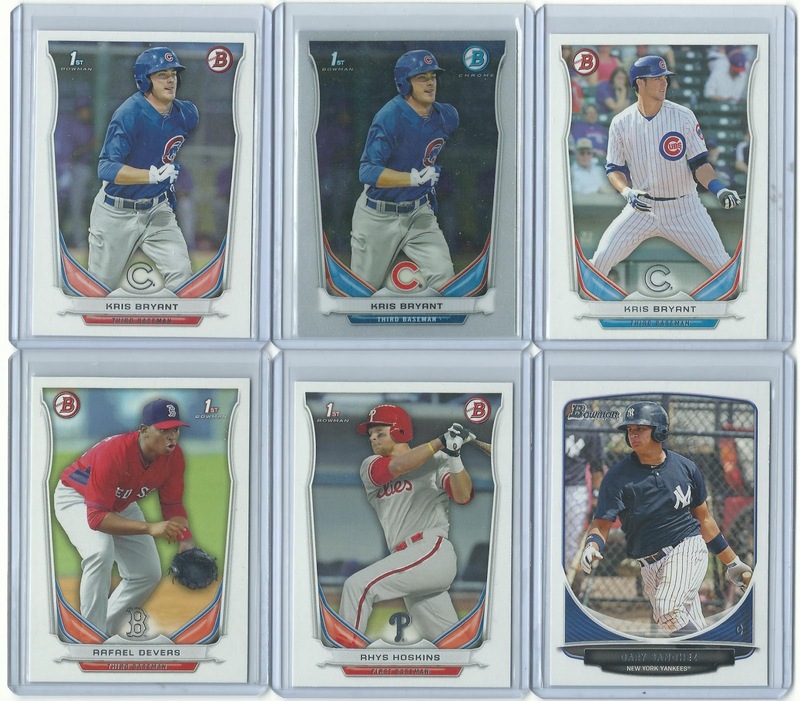 I've got a few cards targeted but haven't pulled the trigger on anything over $1. I'd pimp my port here but I'm still waiting for COMC to complete my submission. Hope you all find some great deals!